*The links in this post are affiliate links and I will receive a small commission if you make a purchase after clicking on my link. Read my disclosure policy here. Summer is here, so do you really want to be stuck inside an office waiting on phone calls and missing out on glorious weather for the next few months? Didn't think so. 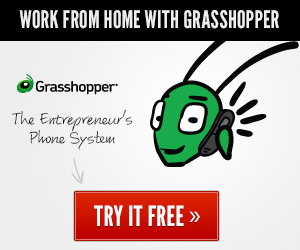 Grasshopper lets you create a suite of business phone numbers to help you run your business using your cell phone! More than 100,000 customers are happily using Grasshopper as their business line, freeing themselves up expand their business beyond the boundaries of four physical walls. If Grasshopper let's you break free into the greater world beyond, why would you choose to be chained to a desk? You can upgrade or cancel your service any time you wish and their customer service team is excellent! Take a look at Grasshopper today.